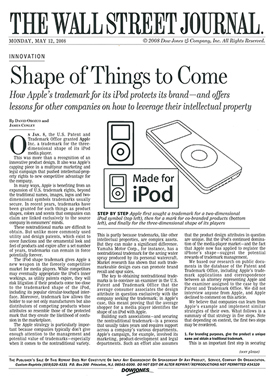 On Jan. 8, the U.S. Patent and Trademark Office granted Apple Inc. a trademark for the three-dimensional shape of its iPod media player. This was more than a recognition of an innovative product design. It also was Apple’s capping piece in a multiyear marketing and legal campaign that pushed intellectual-property rights to new competitive advantage for the company.